Late in 2011 the American Academy of Pediatrics stated that quilts, pillows, comforters, sheepskins and other soft surfaces are hazardous when placed under an infant or loose in the sleep environment. Due to a new understanding that exhaled carbon-dioxide may pool in bedding and be breathed back in, it is now recommended that infants sleep on backs on firm surfaces and without quilts, etc. As makers of baby quilts we should be aware of these recommendations and closely follow the advice of the baby's physician before covering an infant with a blankee. Held in conjunction with Saturday Drop-In on the third Saturday of most months. Many of our dedicated volunteers have been coming monthly for over 20 years. New volunteers are always warmly welcomed and encouraged to join in this activity. Supplies are provided. Just bring your helping hands and willing hearts. This group has given us 5600+ quilts for distribution over the years. Donate fabric and supplies. Quilting weight cottons and sewing supplies that are not musty from storage are always welcome. If you are prewashing, please use unscented soap and fabric softeners. If your donations are not useful for our quilts we will see that they are shared with other non-profit organizations, schools or recycling centers. Larger pieces of batting that could be pieced. Deliver smallish donations to any EBHQ activity or New Pieces Quilt Store. For large collections please e-mail EBHQ.DDCQP@gmail.com to make delivery arrangements. Guidelines for making DDCQP quilts. 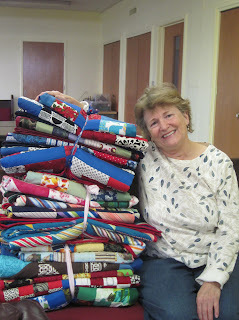 EBHQ member Ingrid Pelton is known as “our quilt fairy” to many of our volunteers. Every two or three months Ingrid delivers a huge stack of completed children’s quilts just like this all ready for distribution. In 1988, one woman in Berkeley decided to make a quilt to comfort a child with AIDS. Friends and neighbors soon joined the effort, and then more and more joined. As the years passed, the network of volunteers in Children's Quilt Project (CQP) grew to reach every state and six foreign countries. 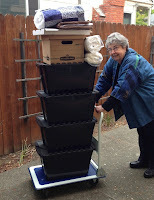 After eight years, Diane Dehler, the founder and Executive Director of CQP officially closed the non-profit organization, stating, “I feel that we have served our purpose of educating the public about the need of babies and children living with AIDS for comfort and love. When CQP first started, we were the only voice at national AIDS conferences for these children. As the needs and numbers were brought to the attention of quilters across the country, their outpouring of love and concern helped to develop education and understanding. When CQP officially closed in 1996 thousands of community organizations across the nation had developed new networks to provide comfort to three groups of special children: children living with AIDS and HIV disease, children born drug-addicted and homeless children. At this time, the Executive Board of East Bay Heritage Quilters voted to act as the coordinating organization to continue CQP established activities in the Greater Bay Area under the name of Children's Quilts/East Bay Heritage Quilters. Quilt Project from 1988 until her death in March, 2015. During Deanna's tenure CQP distributed an average of 1200 quilts each year. Her impact was so great that now a committee is needed to fill her shoes. After Deanna's death, EBHQ's Board of Directors voted to rename Children's Quilts/EBHQ to Deanna Davis Community Quilt Project (DDCQP). Sometimes when your donated fabric comes in to be sorted it is so cute a volunteer sorter just can't resist and has to sit right down and sew up a quilt top herself immediately! 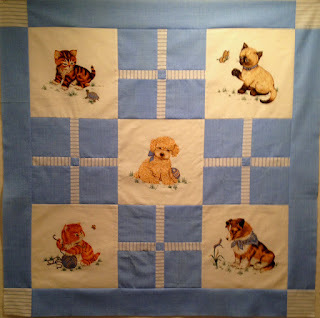 This sweet quilt is the result from Susan Dague's machine today. Thank you Susan and thank you donor!